We see ghosts. And they are drawn to us. Sometimes, when a person dies, their spirit goes looking for somewhere to hide. Some people have space within them, perfect for hiding. Makepeace has learned to defend herself from the ghosts that try to possess her in the night, desperate for refuge - but one day a dreadful event causes her to drop her guard. Now she has a spirit ins We see ghosts. And they are drawn to us. To ask other readers questions about A Skinful of Shadows, please sign up. I always knew I would be reading this book after being lucky enough to read the sampler from Netgalley back in the summer. And what a wonderful treat of a book this was. Set during the English civil war, at the height of witch hunts, comes the story of a family with a very unusual gift. Makepeace, our main heroine, was an excellent character and her journey to maturity and peace is a difficult one for her but a terribly satisfying one for the reader. And what a wonderful set of companions to travel with! This was a 5 chapter sampler given by Netgalley as an ARC. It was great! This in itself is no surprise if you have read The Lie Tree by the same author. 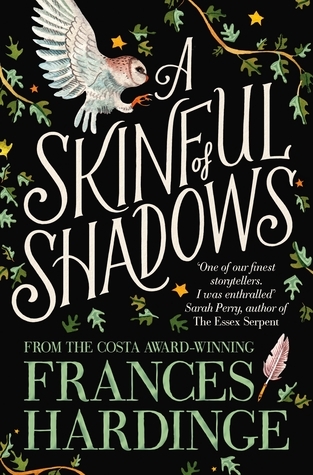 “A Skinful of Shadows” by Frances Hardinge is the follow-up to her 2015 book “The Lie Tree”. However, “Shadows” is set just prior to the English civil war in the 1650’s era and utilizes as a background the gaining momentum of that war. The seventeenth century is not a common time period in which to set a YA book. The book gives us castles, hungry soldiers, plagues, and suspicious townsfolk. Did I mention it also gives us ghosts? Oh yes, a number of ghosts. One of the great aspects of the story is “A Skinful of Shadows” by Frances Hardinge is the follow-up to her 2015 book “The Lie Tree”. However, “Shadows” is set just prior to the English civil war in the 1650’s era and utilizes as a background the gaining momentum of that war. The seventeenth century is not a common time period in which to set a YA book. The book gives us castles, hungry soldiers, plagues, and suspicious townsfolk. Did I mention it also gives us ghosts? Oh yes, a number of ghosts. One of the great aspects of the story is that we the reader learn, grow, and gain knowledgeable life lessons along with our POV character, the young Makepeace, who learns early in the narrative she is being groomed to be the receptacle of centuries old ghosts aka souls. Like all primary characters in YA narratives, Makepeace is rebellious and strong willed, so wants a say in the proceedings. Her first rescue, to which she becomes host, is a mistreated circus bear. Makepeace discovers just how difficult it is to trust people, a good life lesson. This becomes more and more important as she wanders through the countryside searching for safety. A rich and endearing story “A Skinful of Shadows” becomes a bit episodic due to just when it seems like Makepeace has finally figured things out she must venture further on again seeking new answers to new questions. Frances Hardinge's latest offering certainly didn't disappoint, in fact, she may just be one of my new favourite authors. Her writing is so original, innovative and different, I don’t know where she gets all her ideas from but I’m praying she never runs out. This novel blends historical fiction with the supernatural, and the pair get along famously. The central character is Makepeace, a girl who grew up in a Puritan community in the years leading up to the English Civil War in the 1640s. After t Frances Hardinge's latest offering certainly didn't disappoint, in fact, she may just be one of my new favourite authors. Her writing is so original, innovative and different, I don’t know where she gets all her ideas from but I’m praying she never runs out. This novel blends historical fiction with the supernatural, and the pair get along famously. The central character is Makepeace, a girl who grew up in a Puritan community in the years leading up to the English Civil War in the 1640s. After the death of her mother, she is taken in by her formerly estranged father’s family, the Fellmottes. She soon discovers that the members of this ancient, aristocratic family have the ability to capture, and be used as a vessel for, spirits, and that maybe there was more behind her mother’s decision to hide Makepeace from them than she realised. Before she even has a chance to understand her gift, Makepeace is inhabited by the violent spirit of a murdered circus bear, who she henceforth has to share her head-space with, and, although it may sound ridiculous, Hardinge managed to develop their initial animosity toward each other into a genuine, and quite moving, friendship. The Fellmottes are quickly revealed to have sinister plans in store for Makepeace and her abilities, and her bear becomes her faithful guardian and the only one in the world she can trust. Makepeace has the trademark of all Hardinge’s heroines; she’s resourceful, curious and recognises her differences as her greatest strengths. The narrative is incredibly absorbing and while the plot is driven by the feud between Makepeace and the Fellmottes over her supernatural abilities, there are still numerous references to the historical context and, more than anything, it is the brutality of the Civil War that really sets the tone of the story. Hardinge ultimately seems to have a rather scathing assessment of both sides in the conflict, with characters like Livewell, the disillusioned Puritan, and Symond, the Royalist who becomes a Parliamentarian simply to be free of his duties as a Fellmotte, illustrating that no side had the monopoly on righteous ideology and each was spouting their own version of ‘fake news’. Earlier this year I had the pleasure of reading Frances Hardinge’s A Face like Glass, and afterward I just knew I had to read more of her work. Because of this, I picked up the audiobook of A Skinful of Shadows, and I’m happy to say it did not disappoint. The book turned out to be one of the most wonderfully magical and imaginative Young Adult novels I’ve ever read—in other words, everything I expected from the author. Set in the mid-17th century in the time of the English Civil War, the story stars our protagonist Makepeace who lives with her mother Margaret in the very Puritan town of Poplar. For as long as she can remember, terrible ghostly figures and other tortured spirits have haunted Makepeace’s dreams, but Margaret has remained stubbornly tightlipped about the topic, even when it is clear she knows why the dead are interested in her daughter. Instead, Margaret forces Makepeace to spend one night every few months locked up by herself in the darkness of the town’s cemetery crypt, telling the girl she must confront her fears in order to build stronger defenses against the ghosts. “One day you will thank me,” Margaret tells her daughter, but as the years pass, Makepeace grows more resentful of the cruel treatment, and the relationship with her mother was never the same again. Then one day, during a particularly bitter argument, Margaret accidentally lets slip an important piece of information about Makepeace’s father, a subject rarely spoken of in their household. This precipitates a chain of tragic events that leads Makepeace to the discovery of where she came from, as well as the origin behind her nightmares. Never did she imagine that the truth would be so terrible though, as she suddenly realizes the forces of evil her mother had been trying to protect her from. Understanding much too late, Makepeace lets her guard down in a moment of weakness, unwittingly allowing a ghost to invade her mind—except this ghost is different from the ones she has encountered before, being the spirit of a frightened, angry bear. One thing I’ve learned from reading Hardinge is that you can never predict how her stories will play out. When I first read an early synopsis for this book which describes Makepeace and the ghosts in her head—which includes a motley crew of outcasts, misfits, criminals and one dead bear—I had no idea what I was going to be in for. I certainly did not expect the plot to be so darkly twisted and yet so whimsically magical at the same time. The ideas in A Skinful of Shadows are astonishing in their originality and complexity, and I can’t tell you how refreshing it is to read a YA novel that isn’t clogged t0 the gills with rehashed tropes and paint-by-number characters. On that note, I also loved the protagonist Makepeace, who exhibits uncommon bravery in the face of the unknown. All her life, she has been surrounded by lies, even from her own mother, who was admittedly just trying to protect her. Still, by withholding the truth, Margaret has only managed to make her daughter more defiant, and like most confused adolescents, Makepeace occasionally lets her temper get the better of her. Still, instead of turning me off, the protagonist’s little acts of defiance only endeared her even more to me, because it made her feel genuine and easily relatable. As a coming-of-age tale, this book really shines in showing the emotional impact of living a life caught in the middle. Makepeace has never felt like she belonged in Poplar, and later finds out that her ability to see ghosts and absorb them into herself is the result of her father’s bloodline. And yet, when she finds herself at Grizehayes, the ancestral home of her father’s family, she is quite horrified to discover what exactly her powers can be used for. Worst of all, instead of finding acceptance with others like her, she is threatened and manipulated, and the only person she ends up trusting is a half-brother named James, who shows her kindness. And then, of course, there’s the bear. Out of all of Makepeace’s relationships, the one she has with her ghostly beast passenger was by far my favorite—and not just because it’s so strange and wonderful. Having the spirit of a wild animal in your head is as scary as it sounds, but eventually a deep rapport forms between the two of them, with Makepeace trusting the bear’s instincts and “forest wisdom” to guide her. For a companion who isn’t even human, and mainly only communicates with our protagonist through senses and emotions, bear was a surprisingly deep and heartfelt character. This is only my second novel by Frances Hardinge, but I already feel confident in saying this is not a fluke. She is one of the most creative storytellers I’ve ever read, with a clear talent for crafting strong and evocative narratives whose depth of emotion will stun you. A Skinful of Shadows has firmly placed her on my must-read authors list, and I can’t wait to see what she’ll write next. Ms Hardinge was on my radar for a very long time, and finally managed to read her. Bad thing I never knew that it was a follow up but the good thing was I never realized before or after reading it that it was a follow-up to The Lie Tree. Only after reading other reviews I came to know of this fact. But I guess it does not matter because I enjoyed this book and never felt that it had some references from some other book. Anyways, coming back to the book I never thought this would be such a dark bo Ms Hardinge was on my radar for a very long time, and finally managed to read her. Bad thing I never knew that it was a follow up but the good thing was I never realized before or after reading it that it was a follow-up to The Lie Tree. Only after reading other reviews I came to know of this fact. But I guess it does not matter because I enjoyed this book and never felt that it had some references from some other book. Anyways, coming back to the book I never thought this would be such a dark book. I see people mention that the author writes children’s stories but this was definitely not for kids. Set in the times of English Civil War, a 12 year old Makepeace has been living in a small village with her mother. Things changes soon after her mother dies. Her relative sent her to her father’s home, Grizehayes. Makepeace has a special magic within her which she thought was a curse upon her but slowly she realized that this magic makes her an important part of the powerful Fellmotte family. There she met her step brother James, and they started making escape plans but alas life was not so easy for these two. James got stranded in a deeper conspiracy and Makepeace does everything in her power to cling to this last person whom she calls her brother. The magic system in this book was new to me. Makepeace’s rebellion against Fellmote is quite inspiring. She takes some great decision many times but at others her naïve and honest self puts her in dangerous situation. It was a remarkable journey of a girl who wanted to be loved but got herself tangled in the power struggle of Fellmotte family and then later on English civil war. Also, I loved how Makepeace’s transition from a timid girl to a clever girl. I was worried for her survival but the author made her change flawless. It was not sudden but gradual hence so believable. Ms. Hardinge writes beautifully. She knitted a web with her characters, their weaknesses and strengths and a spellbinding story, it was hard to put it down. It was haunting and yet mesmerizing too. I was expecting children’s story but this turned out to be a darker tale of coming of age. I loved The Lie Tree by Frances Hardinge, and had high hopes for her next offering. I wasn't disappointed. This was the perfect blend of history, magical realism and dark fantasy. Set in the early days of the English Civil War, Makepeace has been raised by her mother to fear and fight off the dead who want to inhabit her body. When events force her to leave her home and live with her powerful father's family, Makepeace must confront the shadows that lurk in the dark and learn more about her 'inh I loved The Lie Tree by Frances Hardinge, and had high hopes for her next offering. I wasn't disappointed. This was the perfect blend of history, magical realism and dark fantasy. Set in the early days of the English Civil War, Makepeace has been raised by her mother to fear and fight off the dead who want to inhabit her body. When events force her to leave her home and live with her powerful father's family, Makepeace must confront the shadows that lurk in the dark and learn more about her 'inheritance' in order to retain her freedom. I loved the background of Puritan England. Frances Hardinge paints a vivid picture of this time period, and I really felt part of the story. I never felt at a disadvantage for knowing little about this historical period because everything is explained so well - although I'm sure I would have gained even more from the text if I knew more about King Charles I. There also wasn't extensive details about various battles or sieges aside from what is integral to the plot itself - which allowed me to really just enjoy the story, and stopped it from getting bogged down in facts. The plot itself starts out a little slow. I wasn't fond of Makepeace's mother, and I found the possessions in the early sections confusing. With no backstory yet developed for Makepeace's family, her mother comes across as extremely strict and almost zealous in her religious fervour without really having a reason behind it. Thankfully, these chapters are swift to get through, and the rest of the story is well paced and carries a good 'adventure' feel to it. The magical realism aspect is well explained, with a good level of mysticism and air of dark fantasy. The Fellmottes are great villains, and the opportunity to have a family completely devoted to living forever through their absolute belief in what they call 'The Inheritance' is wonderful. It's such a unique concept, and I loved it. Makepeace is great. She's almost a shadow herself in the beginning, an almost parallel to the ghosts who wish to inhabit her. Yet we see as she sets out to save her companions, and with each subsequent possession, how much she grows as a character, and develops an aspect of each character she possesses. She's deeply kind, loyal and at heart a just individual. Unlike James, she doesn't try to better herself in front of her Elders, nor is she swayed by the enticement of power. She's also practical. Whereas James has numerous ideas to escape the ancestral home on discovering her families secrets, she's the voice of reason. I didn't really warm to James. Aside from when we first meet him, and he rescues Makepeace he comes across as a 'jack the lad'. Easily swayed and taken in, he also readily drops Makepace when a better offer comes along - leaving her behind to face the music. Hardinge's novels are always a delight to read. I loved Lie Tree and loved this one too. Although a tad less feminist than The Lie Tree, still a great book for teens to read to see girls CAN be their own heros, without the need of a male company. Such a refreshing and imaginative read in this world of love-obsessed young adult fiction. Full review to follow soon! A Skinful of Shadows is everything I know Hardinge is capable of. The story is creepy and brilliant, but heartfelt and emotive. I loved the main character, Makepeace, but as is usual for Frances Hardinge, all of her characters are vivid and filled with life. No complaints about the quality of the writing either; it is a joy to read. This is a great book for Hardinge fans, but also a wonderful starting place if you haven't read her before. As expected, this one is go Amazing. Incredible. Fabulous. "There was a little girl lost in the woods, who was chased by a wolf. She ran and ran until her feet were torn, but she knew that the wolf had her scent and was still coming after her. In the end she had to make a choice. She could keep on running and hiding and running forever, or she could stop and sharpen a stick to defend herself. What do you think was the right decision, Makepeace? Makepeace could tell that this was not just a story, and that the answer mattered a great deal. ‘Can you fight a wolf with a stick?’ Makepeace asked doubtfully. Makepeace thought for a long time. Mother nodded slowly. She said nothing more, and did not finish her story. Makepeace’s blood ran cold. Mother was like this sometimes. Conversations became riddles with traps in them, and your answers had consequences." I loved the blurb from this book. It sounded like nothing I had read before and I was enchanted by the notion of this bear-hearted girl living among ghosts. It had a very appealing magical realism vibe to it. And the book certainly delivered on that aspect. But something stopped me from truly feeling this story. I frequently felt weary from rather than engaged with the writing style. And I'm not quite sure why. In many respects I think it's a case of me not being the right reader. Although it's nothing like this book, I was frequently reminded of my experience reading Katherine Arden's The Bear and the Nightingale because of the style of writing. Both styles are very beautiful in how very detailed they are regarding the fantastical backgrounds of the books but simply are not to my taste. None of the characters feel particularly memorable to me but mostly I think this is a case of a book not being from my preferred genre (I frequently struggle with fantasy) and I would recommend this to anyone who loves old ghost stories mixed with historical fiction. So sadly for me this felt like an exercise in focus and concentration and my desire to see how things all worked out in the end. The dead are often easier praised than the living. Folk look for things far and wide, but seldom close. This story takes place during the English Civil War (ca. 1640 – 1643) so it takes place roughly 200 years prior to the first novel I read by this author and thus shows quite a different kind of England. The two books are independent of one another. However, they show that the author is good at any historic setting. Battlefields, alleys in Oxford and old manors come to life equally in this tale of ghosts possessing bodies and a little girl losing her way with only an unlikely companion to help her along the way. Makepeace has grown up in a Puritan community. After her mother is gone, she is no longer welcome in the village (and not only because she was born out of wedlock). Thus she is sent to her father’s family who are willing to take her in. Lucky girl, right? No, not really. Because while this family is rich and powerful, they also have more secrets than one can count. And they are all lethal. As it turns out, Makepeace is not the only one with the ability to see and feel ghosts and she is not the only person these ghosts are trying to possess. If she wants to survive amongst all these predators, supernatural and otherwise, she has to reign in her ability and ally. Before the backdrop of clashing armies, spying, the unseating of a king and the resulting civil unrest we meet this shy little girl who is self-reliant but also way out of her league. So is her companion. However, they complement one another. It’s fascinating how, once again, the author chose to show at least some religious people. And, once again, they aren’t quite right in the head. Self-righteous monsters who deny a person to be buried in the cemetery simply for (view spoiler)[having given birth to a child without being married (hide spoiler)]. While claiming the moral highground. Seriously?! One can say about old Obediah whatever one wants, but he was absolutely right in his assessment of these people. Of course, that does not mean I agreed with his other world views (especially the ones about women and girls) or actions. But the author also used the religions as well as the ghosts to weave the intricate tapestry that is this book in a such a way that it illuminated humanity's neverending desire not to die. As in the other book I read by this author, I’m very much impressed with the atmosphere she conjured. The world created here is simultaneously familiar through the (accurate) historic setting and fantastical through the ghost element; the blurring of the lines was done splendidly. Just like the feel of the battlefield and danger of discovery. Moreover, the characters, while not all being likeable, were vivid and fascinating and I imagine that isn’t too easy considering that many characters were made up of up to seven others! Grim, dark, quest-like, keeping you engaged from the first to the last page. If authors have golden periods during their careers than surely Frances Hardinge is in one now. Cuckoo Song and The Lie Tree were both brilliant dark fantasy stories with younger protagonists and this continues in that vein. Makepeace and her mother live in a puritan village in England just prior to the English Civil War. From a young age Makepeace is trained to protect herself in a very strange way: her mother has her sleep in the village graveyard overnight to force her to learn to defend herse If authors have golden periods during their careers than surely Frances Hardinge is in one now. Cuckoo Song and The Lie Tree were both brilliant dark fantasy stories with younger protagonists and this continues in that vein. Makepeace and her mother live in a puritan village in England just prior to the English Civil War. From a young age Makepeace is trained to protect herself in a very strange way: her mother has her sleep in the village graveyard overnight to force her to learn to defend herself against the ghosts that she senses there. The ability that makes her able to see ghosts also makes her the perfect target for possession by them, something that she finds out all about when a traumatic event leaves her possessed by the spirit of a beast. But the beast may be all that can save her when she encounters her father's family, many of whom also have the gift. Like in the The Lie Tree Hardinge brings this historical period to intricate life, but not without keeping the story suspenseful as Makepeace's family are revealed in their full horrific detail. Her journey is an interesting one for YA in that the issue is not so much about defining her identity, but the much more basic one of whether she is entitled to an identity separate from that of her family at all. I received the first few chapters of this book from Netgalley, in exchange for an honest review. A richly imagined, eerie start to the novel - more please! I read Frances Hardinge's The Lie Tree a while back and really enjoyed it, so was hoping for something similar in this latest book. I certainly wasn't disappointed! The story (so far) follows Makepeace, a strange young girl with the ability to see dead things. Except, these aren't the sort of ghosts you'd want to meet on a dark night - we're tal I received the first few chapters of this book from Netgalley, in exchange for an honest review. There's much about these opening chapters to completely love - not least Hardinge's ability to weave extraordinary ideas into her tales. Words cannot express how much I loved the idea of the ghost bear (without spoiling too much) - such a stunning depiction, and such an unusual angle to come from. I was growing to love Makepeace too - the author seems to have a knack of portraying awkward, yet highly intelligent young girls. "Bear, I need your eyes. I need your nose. I need your night-wits and forest-wisdom." A Skinful of Shadows was, in short, magical and mesmerizing. This was my first Frances Hardinge book and it absolutely will not be my last. I have been completely taken by her imagination and vivid characters. This is the sort of book that is just as beautiful, if not more so, on the inside as the cover (and just LOOK at that cover!). We are given an intriguing balancing act of well-researched historical detail s "Bear, I need your eyes. I need your nose. I need your night-wits and forest-wisdom." We are given an intriguing balancing act of well-researched historical detail surrounding the English civil war and a whimsical, sometimes dark, ghost story. It was such an earthy, autumnal read and getting to experience this book while the leaves were falling outside my window was so incredibly cozy and nostalgic. The writing is minimalistic enough that it can be easily digested by any level of reader from middle grade and up - and yet it is masterfully crafted and full of beauty that will also appeal to adults who have an appreciation for imaginative stories. The story is driven by lively characters who will draw you right in with promises of friendship, precarious loyalty, and plenty of secrets and intrigue. Makepeace (which isn't really her name, though we never get to learn what her true name is) displays a surprising strength and resourcefulness. She may be a small girl with little worldly influence but her wit and patience enable her to accomplish incredible things in an age where girls are considered mostly worthless. The quirky cast of side characters are humorous, not always reliable, and are introduced in such a unique way that I can't say too much about. I'm not going to give too much more away because much of my enjoyment was in discovering it for myself and getting carried away by the whimsical details. If you like ghost stories, plucky female protagonists, and an atmospheric historical setting, pick this book up. Like a call to some wild and beautiful adventure, this book spoke to some deep part of me that dreams of experiencing life with limitless freedom and earthly boundaries. I resonated so strongly with Makepeace every step of the way and she won't be a character I quickly forget. Really, I just want to type “OH EM GEE FRANCES HARDINGE IS THE BEST” over and over in this space, but I will also add that this is a wildly imaginative dark historical fantasy set during the English Civil War, about ghosts, inheritance, and a dead bear. Hardinge is the empress of delightfully weird and creepy books. This now joins the top ranks of being one of my favorite Hardinge novels. I absolutely loved it! The first half was interesting enough and I liked the setting. But the second half really took off for me as some unexpected things happened. And the ending was perfect. I don’t know what to say about this one. It had a fantastic start, but the last hundred pages was a chore to read. I actually sat this down for almost a week before I picked it back up to try to finish it. The begin felt like a weird, creepy horror story, which I loved, but then the novel takes an unexpected bad turn. The spirit possession plot is set aside and the focus is more about the war, family secrets, and staying in the king’s good graces. There’s also a betrayal angle. For a large chunk I don’t know what to say about this one. It had a fantastic start, but the last hundred pages was a chore to read. I actually sat this down for almost a week before I picked it back up to try to finish it. The begin felt like a weird, creepy horror story, which I loved, but then the novel takes an unexpected bad turn. The spirit possession plot is set aside and the focus is more about the war, family secrets, and staying in the king’s good graces. There’s also a betrayal angle. For a large chunk of the novel, it felt like I was reading a historical fiction novel — taking place in the mid-1600s — but I was expecting more of a horror novel with just some historical elements. If this entire novel had been like the first fifty pages, this would have been a four-star read. It had the right pacing and intrigue until it slowed down and changed directions. There were some nice twists, and parts that I thought were foreshadowing turned out to be misdirects. I did enjoy that aspect of it, because it kept me guessing. Overall, I’m disappointed. It’s definitely not my favorite Hardinge novel. I'm not sure if I misread the summary or if the summary was misleading. If you’ve never read a Frances Hardinge novel, I suggest that you begin with Cuckoo Song. While interesting and original this young adult horror story had a bit of an identity crisis as it tried to marry its horror story with historical war. A Skinful of Shadows starts out very solid as we learn about our lead gals odd ghost 'issues'. Her Mother that appears cruel and the Aunt and Uncle who have no interest in her sets our lead gal up as a neglected, alone and forgotten soul. Not unlike some ghost/spirits might be. There's no real reason A Skinful of Shadows needed to have an identity crisis. Set during the English civil war, our horror story is the focus, but certainly our characters are affected by the battle events around them. Which was all well and good until our lead gal ends up caught up in a scheme that will benefit one side of the war. While it gets our characters away from certain situations this interlude of smuggling, spies, infantry movements and battlement sieges is just dull. Instead of having an engaging reason to care, and partially because our lead gal doesn't care who wins, I just couldn't bring myself to feel any passion about the war or whose side wins or losses. If you're hoping for information about the civil war setting this is the absolute wrong book as the majority of the information is fictional. While there are many ghost/spirit haunting stories, and there may even be some in which the spirits haunt live bodies, A Skinful of Shadows still stood out for me as an unique and compelling story. The added touch of a dynasty family with great political and financial power helped put our characters front and centre to many situations we may not have encountered otherwise. This use of a non-noble but high ranking household is brilliant by Hardinge. And while servants, like our main gal, embroiled in high family affairs is not a new setting, Hardinge takes it to a whole new level by defining a servant as something more than a pushy kitchen girl and instead she is a rare commodity that the main family cannot afford to lose. Perhaps it's very sad and pathetic of me but the use of a bear spirit in this kept reminding me of Disney's Brave. Don't get me wrong I adored our bear and his ferocious, confused and yet protective role in our story. But each time a bear spirit was referenced all I saw was our lead girl dressed up as Meredith. This was distracting for me. And so I think a different animal might have been a better choice. A cougar could easily have played the same role and maybe helped distance the small similarities to Brave bear spirit. This was my first Hardinge book. I have more a couple more of hers on my shelf for the future and I'm definitely excited to read them. While I give this a 3.5 stars it's a solid 3.5. Assuming you can push through the dragging war bound middle of the novel then I believe most will enjoy Hardinge's creepy and (mostly) compelling ghost story. I don't think I'm exaggerating when I say that this is the most original book I've ever read. Absolutely unique & mesmerising. Frances Hardinge is a national treasure. Makepeace, the girl with a bear in her soul, is going to stay with me for a long time. Nonetheless, I might give it another chance again in the future! voices crowd the girl's cranium); plus shades of shades: those ghosts just keep on coming. And talking. And the novel gets all picaresque, going on the road to both Oxford and London. And to battle. And to see the king. It's hard to keep caring through the many, many plot twists, not all of them surprising or plausible. Sorry, I wanted to like this more. From the 5 chapters that were included with this ARC, I'm definitely intrigued in reading the rest of this story. The story starts out strong and is interesting and engaging from the the very first page with interesting characters and a very enticing premise.. I'm looking forward to reading the rest of the story. I have not yet read the book in its entirety, so perhaps it does get better, but from the free sample, I am not particularly fond of the book. Makepeace's mother is terribly strict and very secretive. She wants to protect her daughter from some great danger but refuses to give her any idea of what it is she is up against. On this issue, I am entirely on Makepeace's side. And I know this has nothing to do with the plot, and it is explained in the story why her name is what it is, but my goodness I have not yet read the book in its entirety, so perhaps it does get better, but from the free sample, I am not particularly fond of the book. Makepeace's mother is terribly strict and very secretive. She wants to protect her daughter from some great danger but refuses to give her any idea of what it is she is up against. On this issue, I am entirely on Makepeace's side. And I know this has nothing to do with the plot, and it is explained in the story why her name is what it is, but my goodness I loathe the name Makepeace. I've read a chapter sampler of A Skinful of Shadows, and it was a delight to read. Set in historical England, the sampler was a wonderful introduction to a kind-hearted but fierce main character, an intriguing element of magical realism, and exquisite writing. Though these chapters foreshadowed a dark plot of hardship, struggle, and pain, this story has the potential to be a magnificent epitome to strength in kindess and in friendship. I'm looking forward to the release of the full and final cop I've read a chapter sampler of A Skinful of Shadows, and it was a delight to read. Set in historical England, the sampler was a wonderful introduction to a kind-hearted but fierce main character, an intriguing element of magical realism, and exquisite writing. Though these chapters foreshadowed a dark plot of hardship, struggle, and pain, this story has the potential to be a magnificent epitome to strength in kindess and in friendship. I'm looking forward to the release of the full and final copy. Um...so... I maybe checked again today. Just to look at it. Edit: I am so excited for this book I check this page literally every week to make sure it's really not going to be released until October 10. And I'm so excited for this book I'm not even embarrassed about that. This is a 3.5 stars for me, average but still fun and playful to read. I liked the writing, its light but descriptive. I simply didnt like the plot as a whole, it didnt interest me. Cant do much about it really. But I did love the main character, the supernatural factor and her first friend she makes :) I definitely want to read more by the author, she seems to choose interesting plots that are suspenseful and have a dark side to it. This is good. (What a relief.) This is more of historical-fantasy Hardinge, but being set in 1640s England makes all the difference. Here's a setting that's integral without being weighed down by its own implications. His face was mournful, lined, and marked by a rigid uncertainty. There was something tense and waiting to happen in his manner - perhaps outrage, the baby sibling of dignity. There is so much to love here. There is so much to love in the entire section set in Oxford. The revelation that families were joining both sides to protect their estates? Fabulously done. The names are, per usual, entirely too on-the-nose. Makepeace! Makepeace, in a book about war. It's almost as bad as Faith, in a book about science. "You've been missing things, important things, because there are people you never notice. And now it's too late for you all. This isn't like the other wars you've fought. Your wits and centuries won't help you this time. This is new." I can't say I love the ending: it reads as very small in a book that goes very big, where actions (until the ending) can potentially impact the war. And it feels directionless, in a way, and maybe a little cruel. I don't want to suggest this novel isn't good. It is. It's a fully realized story. It's got themes of its own, but those are hidden beneath the plot instead of comprising the plot. You could write a thesis on Bear, or on early childhood education, or on the class system or loyalty or war, but you don't have to. You can read the story and enjoy it on its own merits, which is exactly what I did, because after The Lie Tree, I don't want anything more. I don't want story dragged down by historical impossibilities or overtones of preachiness. Frances Hardinge spent her childhood in a huge, isolated old house in a small, strange village, and the two things inspired her to write strange, magical stories from an early age. She studied English at Oxford University and now lives in Oxford, England.